This view of a portion of the Eridania region of Mars shows blocks of deep-basin deposits that have been surrounded and partially buried by younger volcanic deposits. Ancient Mars may have harbored deep-sea hydrothermal vents, the same type of environment where many scientists think life on Earth got its start, a recent study suggests. Observations by NASA's Mars Reconnaissance Orbiter (MRO) show evidence of ancient sea-floor hydrothermal deposits within the Eridania basin — a region in the southern hemisphere where some of the Red Planet's most ancient crust is exposed. "Even if we never find evidence that there's been life on Mars, this site can tell us about the type of environment where life may have begun on Earth," co-author Paul Niles, a planetary scientist at NASA's Johnson Space Center in Houston, said in a statement. "Volcanic activity combined with standing water provided conditions that were likely similar to conditions that existed on Earth at about the same time — when early life was evolving here." The Eridania basin of southern Mars is believed to have held a sea about 3.7 billion years ago, with seafloor deposits likely resulting from underwater hydrothermal activity. Similar deep-sea hydrothermal environments found on other worlds — possibly beneath the icy surface of Jupiter's moon Europa and Saturn's moon Enceladus — could facilitate the evolution of extraterrestrial life, according to the statement. Using data from MRO's Compact Reconnaissance Imaging Spectrometer for Mars instrument, the researchers were able to identify the mix of minerals contained in the deposits, as well as the shape and texture of the thick bedrock layers. Also, the observations show that lava flows buried some of the deposits after the ancient Eridania sea disappeared, which further supports the idea that this region was volcanically active. As scientists continue to search for signs of past life on Mars, the recent study highlights yet another type of wet environment that may have once existed on Mars. "Ancient, deep-water hydrothermal deposits in Eridania basin represent a new category of astrobiological target on Mars," researchers said in the statement. 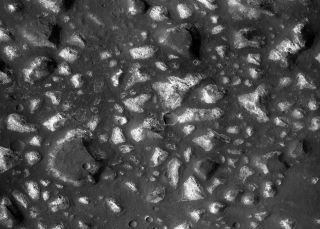 "Eridania seafloor deposits are not only of interest for Mars exploration, they represent a window into early Earth." Their findings were published online July 10 in the journal Nature Communications.